Many of you who made representations to South Ayrshire will already know that permission has been refused for a proposed single 70m turbine at Glenauchie. Reasons for the decision can be found in the following documents: a brief summary in the Decision Notice, and a longer discussion, including consideration of the representations made, in the Regulatory Panel Report. These documents (along with all the representations) are also available at South Ayrshire’s online planning site. Dersalloch – thanks for your objections! The deadline for objections to Dersalloch wind farm has now passed. Despite the short notice, we made our feelings known! We will let you know the details (how many objections – and so on – as soon as we know them). 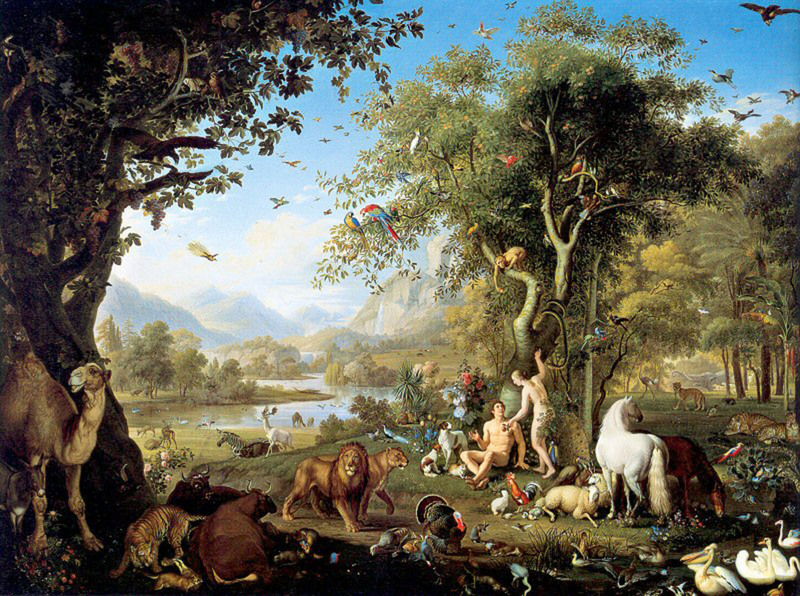 To give everyone a day off from wind farms, I am posting a picture of the Garden of Eden, possibly the last place where there definitely weren’t any. It seems to me to bear a remarkable resemblance to the upper Girvan valley near Straiton (with added camels). Better late than never. It took some time to track down some digital images of the Dersalloch viewpoints. Here are some PDFs of the original “official” views from the Scottish Power Renewables Environmental Assessment (as of 2012), and below, there are some extra jpgs of views which weren’t included but should have been. The view over Loch Doon from the A713 was only supplied by SPR as a wireframe. 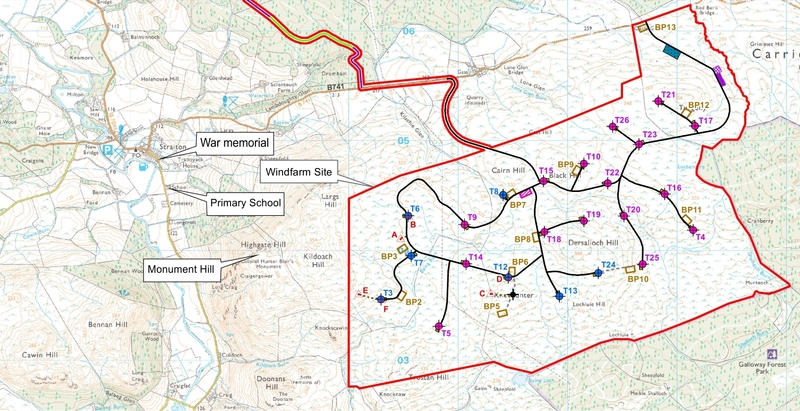 Note on the Alitzourie viewpoint: (not used by SPR) – from the Kirkmichael to Straiton Road – where it emerges from trees just above Altizourie and from where you see the whole of the Monument Hill, the upper Girvan valley, Bennan Hill, and the woods and fields of the Blairquhan estate, with Blairquhan castle also visible through the trees. 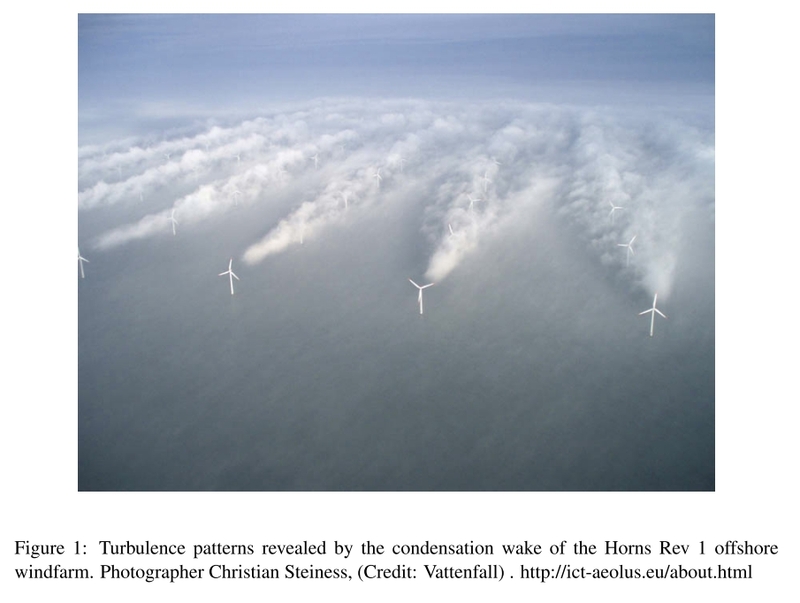 Note on the wireframe: shows the turbines that would be visible from the Scottish Dark Sky Observatory. Note on the uncaptioned jpgs taken from deep in the Galloway Forest (the Loch Enoch hills): these are from Jez Turner, who writes : “Have you realised that Big Hill of Glenmount is visible from the sylvan White Lochan of Drighorn, deep in Galloway Forest Park between Curleywee and Millfore?” And so of course, would the turbines of Dersalloch and Glenmount wind farms. Apologies for the late posting. A lot of work is going on in a very short time! Don’t forget the deadline of the 28th, and feel free to send the link to this page to concerned friends and relatives! The photo (taken from Bennan Hill) shows the site where SPR plan to put their 23 giant turbines: in the front, the Doonans, behind, Trostan Hill, Big Hill of the Baing, and snow-covered in the distance is Cairnsmore of Carsphairn. This beautiful hill country is on the borders of the Galloway Forest Dark Sky Park, and the turbines will be visible from the Scottish Dark Sky Observatory (not to mention Ayr and Troon!). Don’t let them do it! The good news is that South Ayrshire is maintaining their objection, so it should go to a Public Inquiry. Make sure your opinion is heard too, before the 28th March. If you haven’t already done so, you can click here to object. All photos are copyright of their respective authors. See the originals and another 250 or so striking images of Loch Doon, Night Skies above the Dark Sky Park, Dalcairney Falls, on Flickriver: click here. Glenmount and Dersalloch wind farms are just two of the wind farms which threaten these landscapes and these night skies. Our last post (Several thousand object to Glenmount) went off too early in the morning. The deadline for the objections to Dersalloch is 28th March not 28th May. Dersalloch info to follow very shortly. Apologies: your editor is now off for a cup of tea.